Hey, that’s just good parenting. 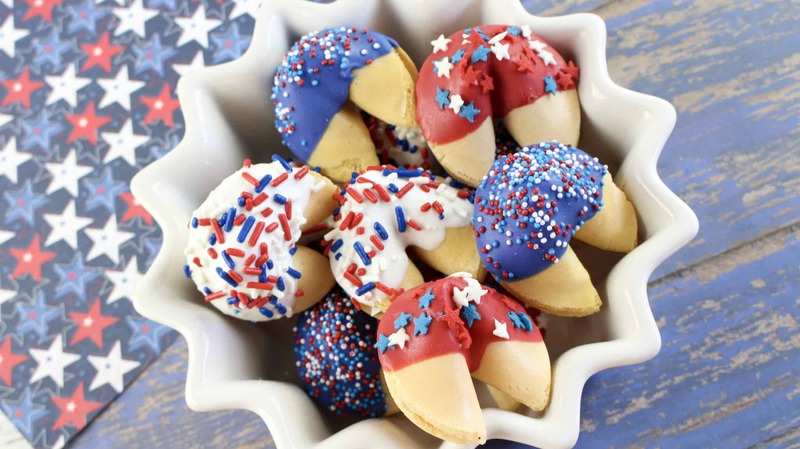 You’ll need: Fortune Cookies, assorted sprinkles, and candy melts in the color of your choice. We are using Red, White, and Blue. 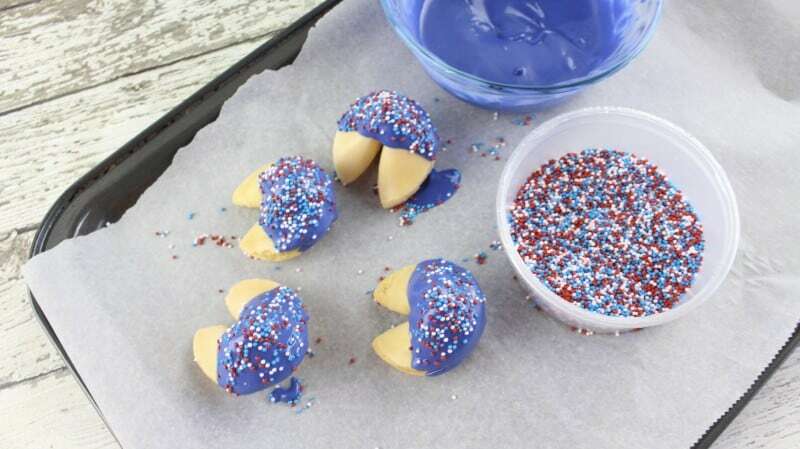 These Candy Melts are made by Wilton and you can find them in the craft department at Wal Mart or most arts and crafts stores in the cake decorating section. To begin with, line a baking sheet with parchment or waxed paper. Then, place your first color candy melts in a microwave safe bowl and microwave for about 45 seconds, then stir. Repeat until melted and smooth. 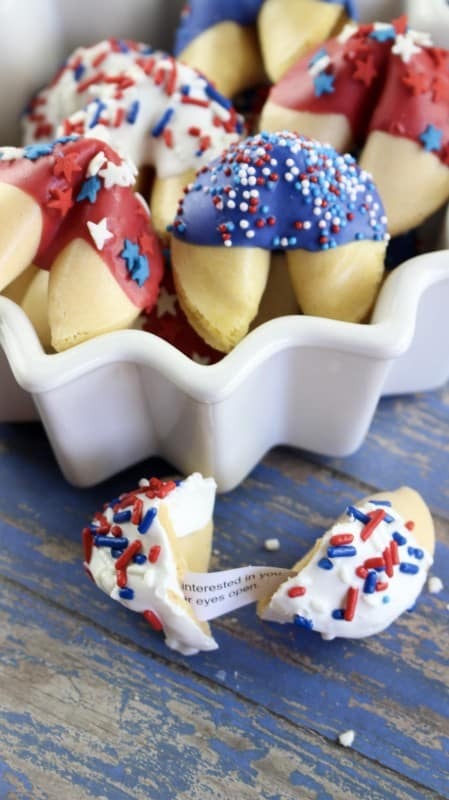 Dip the middle of each fortune cookie in it and immediately top with sprinkles. Repeat this process with your other colors and sprinkles and let the cookies sit on the lined baking sheet until hardened, about fifteen minutes or so. Store in airtight container until ready to serve. Enjoy! Add the first color of candy melts to a microwave safe bowl and microwave for 45 seconds. Stir until melted and smooth. Dip 4 fortune cookies into the melted chocolate and place back on the lined cookie sheet. Immediately sprinkle with sprinkles before the chocolate hardens. Repeat with other candy melt colors. Wait 15 minutes for the chocolate on the cookies to harden before serving. 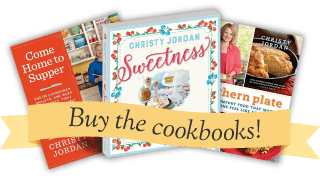 If you’d rather not run around for all of the ingredients, here is a quick list of links to everything on Amazon. Note: These items may be cheaper locally. I usually get my candy melts at Wal Mart or Michael’s and you can usually find seasonal sprinkles there as well. May we think of freedom, not as the right to do what we please, but as the opportunity to do what is right. How cute! My boys, 19 and 17, are going to love these! My son is 17 and he DEARLY loves fortune cookies, he just likes the taste of them. Are your boys that way, too? Love this idea!! 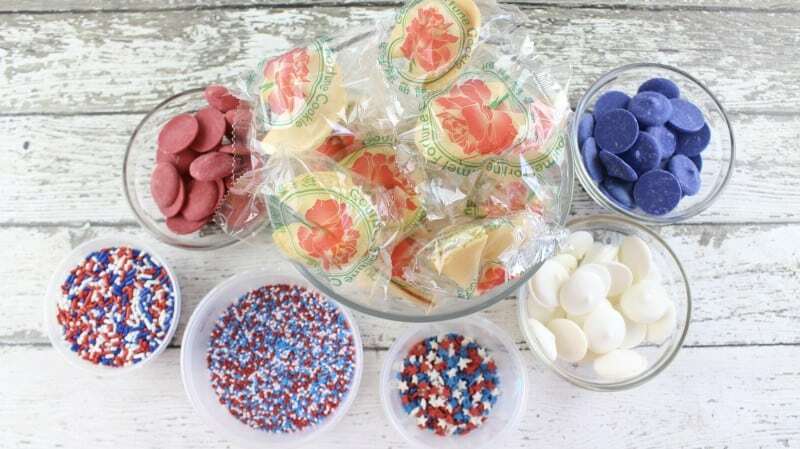 Could you use red and blue food coloring to change the white candy melts instead of buying 3 separate bags, maybe?? Hope you have a very nice weekend Christy! You can use the gel food coloring. You could even just buy white almond bark (on baking aisle, above the chocolate chips) or white chocolate chips as well. Just make sure you use gel coloring rather than the traditional liquid because the liquid will cause the candy to clot. Great thinking and you have a great weekend, too! What a quick but neat idea! Thanks Christy. Thanks Phyl!! So much fun for the patriotic holidays quickly approaching!! Well, that sure looks like fun. My granddaughters will love it. I like the taste of fortune cookies to, hee, hee. Thank you for sharing. Very fun!! I hope you and the girls get a chance to make them, along with making a few memories!! 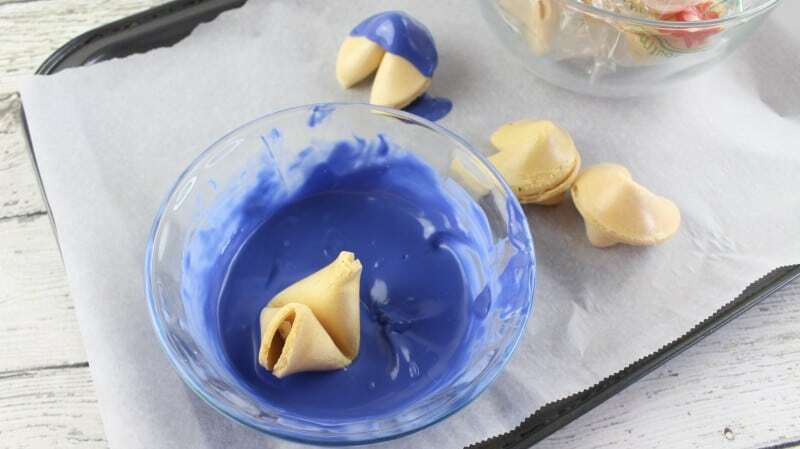 Your fortune cookies are prettier than the ones I saw for sale online, and yours are more affordable, too. The online cookies cost $25 for twelve cookies! Thank you so much Philippe!! Yes, that is pretty expensive and you would miss out on all the fun of making them yourself!! You could make a variation of these using pretzel rods. I saw some Christmas pretzel rods at a party once, and I think these would make the transition to pretzels well. What a fun project, Christy! Yes! You sure could Bonny, thanks for the great suggestion!! !